KATHMANDU, May 21: Nepal’s export to China via Rasuwagadhi customs jumped by nearly two and half times over the first nine months Fiscal Year 2017/18, compared to export figures of the same period a year earlier. According to statistics maintained by Department of Customs (DoC), the country’s exports via the northern customs point swelled to Rs 1.34 billion in the review period of FY2017/18, up from Rs 554.7 million in the first nine months of FY2016/17 -- a rise of 142.5 percent. The country had earned Rs 775.35 million worth of foreign currency by exporting goods to northern neighbor in FY2016/17. In the first nine months of FY2017/18, Nepal has earned Rs 1.34 billion worth of foreign currency through Chinese exports. Talking to Republica, Rajendra Singh, deputy director of Trade and Export Promotion Center, attributed the whopping export growth to cheaper and faster transportation facility on the only major trading route between Nepal and China. “Nepali goods can now reach any Chinese city within 10 days of leaving Rasuwagadhi,” he said. Government officials like Singh say that transportation cost via the route is far cheaper compared to Kolkata port of India. 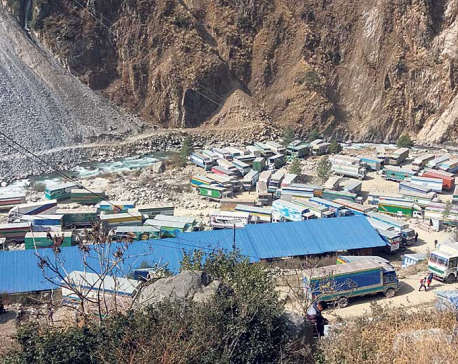 “Although most of Nepal’s export goods are transported via maritime routes through Kolkata port of India, which traders say is costlier and is not preferred by exporters, more and more containers are being transported through Rasuwagadhi customs,” Singh said. Rasuwagadhi has become a popular alternative to Tatopani border point which has remained closed since the earthquakes of 2015. Although only 43 percent of Nepal’s export to China was made through Rasuwagadhi in the review period, export volume grew by 65.6 percent. Nepal’s total export to China in the first nine months of FY2017/18 increased by 60 percent to Rs 2.05 billion. Total export to China was worth Rs 1.7 billion in the 12 months of FY2016/17. Singh explained that such a healthy rise in export to China is primarily due to series of promotion initiatives in China. 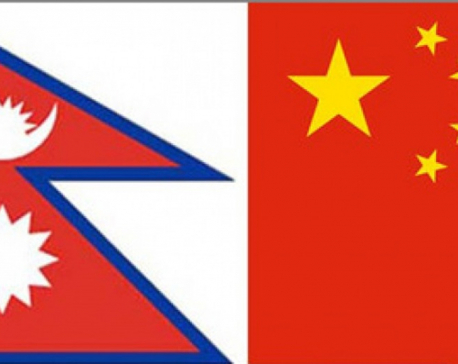 “A significant number of Nepali entrepreneurs visit China for various trade fairs through which Chinese population has become aware of the quality of Nepali goods. It has contributed in increasing demand for Nepali products in China,” he said, adding that the surge in demand for Nepali goods is also because of the fact that better quality Nepali products are available in the Chinese market at a more affordable price. Hand-knotted carpet, metal craft, and sugar and confectionery products are Nepal’s key exports to China. Nepal exported Rs 189.4 million worth of carpets to the northern neighbor over the first nine months of the current fiscal year, compared to Rs 158.9 million in the same period last year. 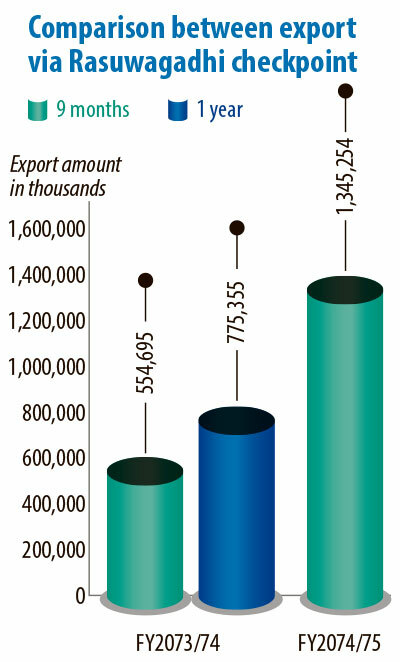 Though export income from carpet has increased by 19.2 percent, quantity of carpet exported seems to have dwindled. While 71,316 square meters of carpets were exported to China in review period last year, Nepal could export only 66,984 square meters in the first nine months of the current fiscal year. Ram Bahadur Gurung, president of Nepal Carpet Exporters’ Association (NCEA), said that the demand for Nepali carpet has surged in the Chinese market. “This is primarily because Nepali carpet is of fine quality. The demand for carpet of superior quality is increasing. This explains why export income from carpet has increased even though export quantity has fallen,” he added.